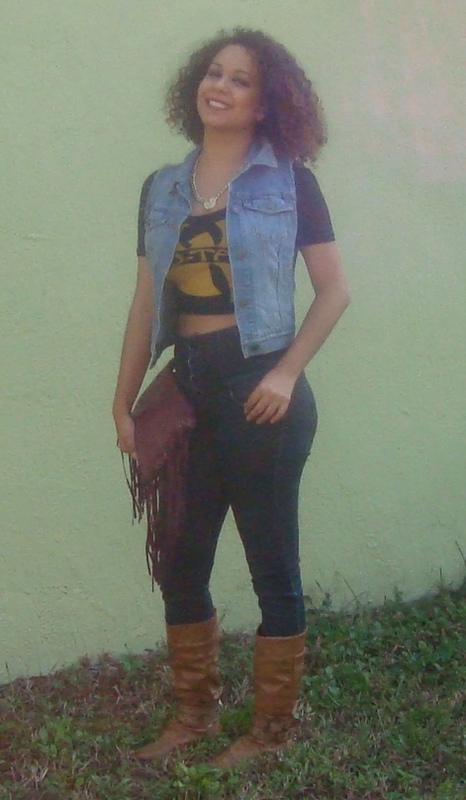 I finally got my hands on this Wu Tang crop top!!! After waiting it out the first go around on forever 21 online and missing it, they restocked the site with this tighter more cropped version than the previous one. I love the printed graphic (obviously super iconic) and it can be paired with so many items both casual and funky. Such a statement piece for many seasons! I paired it with old high waisted jeans, knee high brown boots (forever 21 old season), a denim vest (lighter wash than my jeans) and a burgundy fringe clutch (old season target). Curly hair felt appropriate for the look and I rocked my natural fro out as well. Its the “Wu Revolution”! Check out the links below.